Flip all seats up to accommodate up to five passengers, or fold flat to reveal up to 63.5 cubic feet of cargo space. The intuitively designed cockpit puts everything you need exactly where you want it, including a integrated center stack with built-in storage. This family-friendly feature reminds parents to scan the rear seats when the second-row door has been opened, so no one gets left behind. Higher Chevy Equinox trim levels offer Android Auto and Apple CarPlay that sync your compatible smartphone directly to your SUV. No matter which of the Chevy Equinox trim levels you choose, you’ll enjoy a stylish SUV with all the space you need to navigate through life. Of course, you’ll get plenty of room to relax in the dual-cockpit design, but the 60/40 rear seating provides even more versatility for both passenger and cargo needs. Additionally, you can enjoy stylish standard Chevy Equinox colors like medium grey ash cloth seating or premium options like jet black and brandy leather! Take a closer look at the Chevy Equinox specs with Libertyville Chevy, near Waukegan and Gurnee. Contact us today! 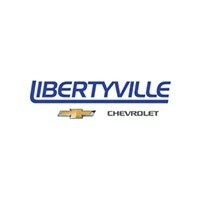 Explore your options at Libertyville Chevy.